At the moment, we are mainly interested in the social and emotional development in the first year of life. How does maternal odor influence emotion perception in infancy? Parents are of crucial importance for the healthy development of a baby. Not only do they take care of a child’s physical needs, such as food and clean diapers, but they are also essential in caring for a child’s psychological needs, offering security, love, and protection. With this project, we want to investigate which role of maternal odor, or the mother’s scent, plays in this context. Is maternal odor alone sufficient to soothe a baby? Does the presence (or absence) of maternal odor impact how a baby reacts to other people? These are some of the questions we investigate primarily in infants between the age of 6 and 7 months. Do infants infer character traits from facial features? First impression matters: If adults encounter another person for the first time, they quickly form an opinion about that person. They might for instance judge a person as more or less trustworthy. Recent studies suggest that already preschoolers make similar judgments. In this project, we are interest in whether such judgments can also be observed in infancy. In addition, we are interested in what might contribute to such judgments and what the underlying neural mechanisms might be. Jessen,S. & Grossmann, T. (2016). 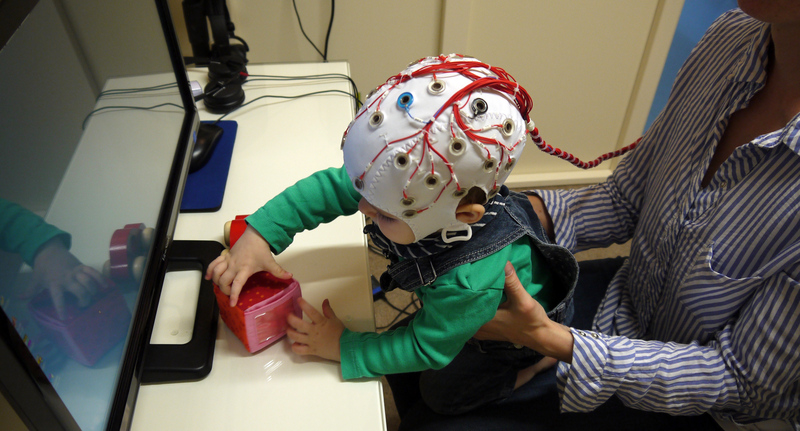 Neural and behavioral evidence for infants’ sensitivity to the trustworthiness of faces. Journal of Cognitive Neuroscience, 28(11), 1728-1736.